Have you ever needed to print something out in a pinch? Well, so have we, which is why we’ve been working hard to bring Google Cloud Print to even more places, making it easier to print when and where you need it the most. 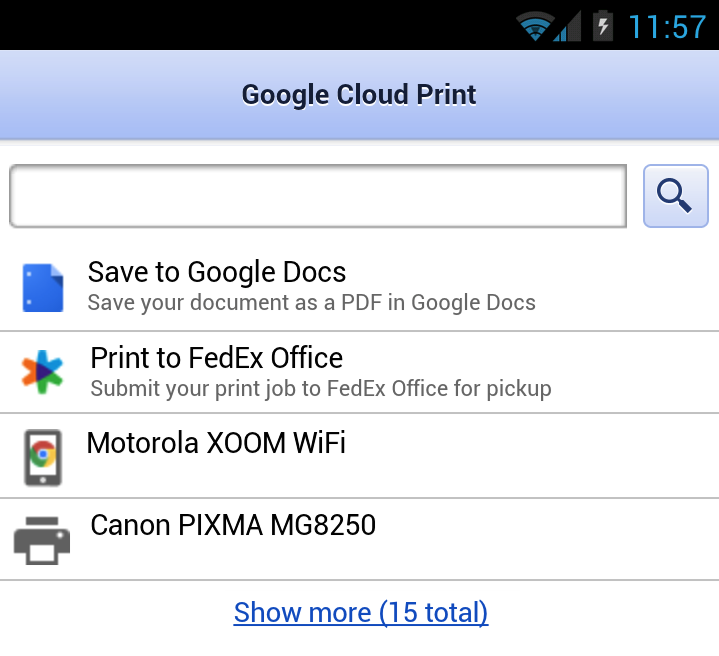 Starting today, you can print to any FedEx Office® location in the US through Google Cloud Print. Simply choose “Print to FedEx Office” in the Cloud Print dialog, and you’ll receive a retrieval code that you can use at any FedEx Office® Print & Go self-service device at more than 1,800 FedEx Office stores across the nation. So if you're on a business trip to California, you can submit a report for your colleague in New York to print out at the neighborhood FedEx Office. We’re also happy to add Canon to the list of companies offering printers that are Google Cloud Print Ready. Now you can choose from a variety of printers from Canon, Epson, Kodak and HP that make it easy to print from anywhere. Finally, we’ve made it possible to send documents to your phone or tablet running Android 4.0, Ice Cream Sandwich through Google Cloud Print. Once you install Chrome for Android Beta and sign in, your Android device will appear as a destination in the Cloud Print dialog. After choosing your Android device, a PDF copy of your document will open in Chrome for Android Beta. 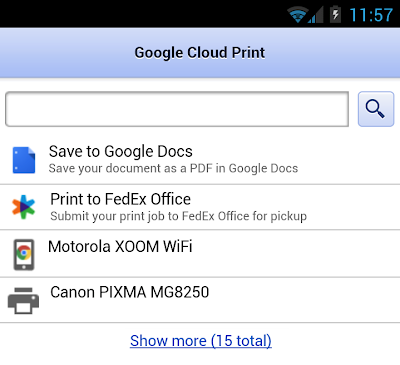 Next time you need to print something to take on the go, save some paper and “print” it to your Android device instead! Chrome for Android Beta in February, we’ve been listening closely to all of your feedback (thank you!). It’s great to hear how so many of you love having the Chrome experience on your Android 4.0 phone or tablet. You can now request the desktop version of a website, in case you would rather not view the mobile version. If you build websites, you may want to take note of a change in the User-Agent specification for Chrome for Android. If you haven’t already, you can install Chrome for Android Beta from Google Play on your Android 4.0 (Ice Cream Sandwich) phone or tablet. As we're still in Beta, we look forward to your feedback so we can continue to improve Chrome for Android. Since we launched Chrome for Android Beta in February, we’ve been listening closely to all of your feedback (thank you!). It’s great to hear how so many of you love having the Chrome experience on your Android 4.0 phone or tablet. , you can. When you’re signed in to Chrome, the tabs you have open on one device are available on all your other devices—just click the “Other devices” menu on the New Tab page. With a click, you can find and open the tab with your directions and be on your way. 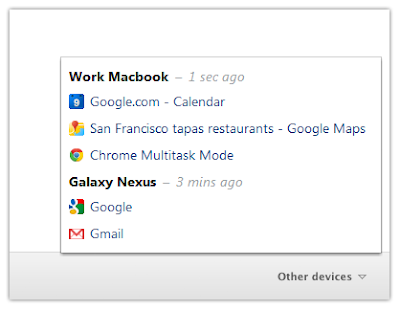 The tab’s back and forward navigation history is also included, so you can pick up browsing right where you left off. If you use Chrome for Android Beta, the tab will also be available on your phone, right there in your pocket when you hit the road. We’ll be gradually rolling out the “Other devices” menu to Beta channel users over the coming week. To give it a try, download the latest Chrome Beta and sign in to Chrome. Happy browsing! Imagine you’ve looked up directions to a cool new restaurant on your home computer. Later, when you’re leaving work, you realize you can’t quite remember how to get there. If only you could quickly pull up the same directions on your office computer with one click! Well, with the latest Chrome Beta, you can. When you’re signed in to Chrome, the tabs you have open on one device are available on all your other devices—just click the “Other devices” menu on the New Tab page. ” view. Ranging from “warm” to “on fire”, this view shows which apps and extensions are currently growing fastest in the store. App subcategories were also recently introduced into the store. These allow you to dig deeper into each app category. For example, in the “Entertainment” category you can click on the “Music & Radio” subcategory to only view music related apps. Searching for a particular app has also improved. Our search box now sports autocomplete suggestions that guide you to the app or extension you are looking for, faster. And for those of you looking for apps with a particular functionality - e.g. apps that work offline - our new app badges can be of help. Just look for them on the top section of an app’s landing page in the store and click on them if you want to see other apps that have the same functionality. They now come in two flavors - playable on Google+ and offline - and more will follow. All of these improvements will especially come in handy as more apps and extensions launch every day. In the last few weeks, almost all the Google+ games have become available in the store, like the new exclusive Kingdom Age. These add to a slate of new Native Client games like MiniNinjas and new productivity and entertainment apps and extensions like Share on Meebo, Hotmail, and Google's My Chrome Theme and Google Play Movies. Over the past few weeks, we’ve introduced several new features to make it easier to discover new apps and extensions. These can be especially helpful, as the number of apps and extensions in the Chrome Web Store has grown to the tens of thousands. Starting today, Chrome Web Store users can try out an early version of the new “Trending” view. Ranging from “warm” to “on fire”, this view shows which apps and extensions are currently growing fastest in the store.